‘R’ is called the resistance of the material. An increase in the value of R results in a decrease in the value of ‘i’. Quantitative definition: Resistance is the opposition offered by the conductor to the flow of electricity through it. Quantitative definition: Resistance of a conductor is defined as the ratio between potential differences between the two ends of the conductor to the current flowing through it. If i = 1, R = V.
Resistance of a conductor can also be defined as the difference of potential across the two ends of the conductor required to pass a unit electric current through it. Every conductor contains a large number of free electrons. When a difference of potential is applied between the two ends of the conductor, an electric field is set up inside the material of the conductor. A free electron (being a negatively charged particle) experiences a force, due to this field, which accelerates it from higher to lower potential side. After acquiring some velocity it suffers collision with other free electrons of the material and loses the acquired energy. It, again, is accelerate and goes through the above process repeatedly. Thus, motion of the electron cannot be termed as free. It experiences resistance forward motion. This resistance is termed as electrical resistance. Resistance of a conductor is said to be ‘ohm’ if a current of 1 ampere flows through it for a potential difference of 1 volt across its ends. Resistance of a conductor is said to be 1 statohm if a current of 1 statamp flows through it for a potential difference of 1 statvolt across its ends. Resistance of a conductor is said to be 1 abohm if a current of 1 abampere flows through it for a potential difference of 1 abvolt across its ends. Thus, if a number of resistances are connected in series with each other, the net resistance of the combination is equal to the sum of their individual resistances. Thus , if a number of resistances are connected in parallel, the reciprocal of the resistance of the combination is equal to the sum of the reciprocals of their individual resistances. Where,‘α’ is known as temperature coefficient of resistance. Temperature coefficient of resistance is defined as change in resistance of the conductor per unit resistance per degree centigrade rise of temperature. Its S.I. unit is C-1. (a) For all metals and most of alloys ‘α’ is positive, i.e., their resistance increases with an increase in their temperature. As a substance is heated, its electrons start vibrating more vigorously and suffer collisions more frequently. A larger number of collisions means more resistance. Hence, resistance increases with the rise in temperature. Value of ‘α’ is greater for metals and smaller for alloys. Therefore metals show more change in resistance, as compared to alloys, when they are heated. This is the basic reason why alloys are used in resistance boxes and metals are used in the construction of resistance thermometers. (b) Substances like carbon and semi-conductors possess negative value of ‘α’. Their resistance decreases with a rise in temperature. Thus, resistance is the opposition offered by the conductor to the flow of electricity through it. That is, resistance of conductor varies directly as its length. As potential difference is applied across the two ends, free electrons move from the end at lower potential to the end at a higher potential. In this process they collide against each other and undergo retardation. A greater length of conductor results in greater number of collisions, thereby producing greater retardation and hence greater resistance. Resistance of a conductor varies inversely as its area of cross-section. For a conductor having greater area of cross-section, more free electrons cross that section of conductor in one second, thereby giving a large current. A large current means a lesser resistance. Here ‘ ’ is the resistivity or the specific resistance of the material. If l = 1, A = 1 then R =  . Thus, the resistivity of material is numerically equal to the resistance of a conductor made up of the material of unit length and unit area of cross-section. Alternatively, it is also numerically equal to the resistance in between the two opposite faces of a unit cube made up of that material. 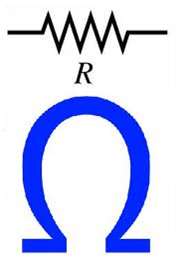 Units of resistivity are ‘ohm meter’. where ro is the resistivity at a reference temperature To and r (T) is the resistivity at temperature T. a is called the temperature coefficient of resistivity and has dimensions of (oC)-1. 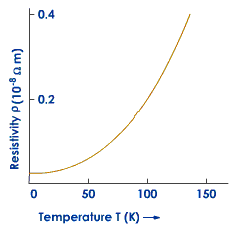 However, the temperature dependence of r at low temperatures is non-linear as shown in figure given below. Where ‘Eg’ is called the [positive energy of the insulator and ‘k’ is Boltzmann constant. Depending upon the value of Eg, the substance behaves like an insulator or as a semi-conductor. For Eg < 1 eV, the value of ‘ρ’ at room temperature is not very high. Therefore the substance acts as a semiconductor. For Eg > 1 eV, the value of ρ at room temperature is high. So the substance act as an insulator. Here n0 has a value of the order of 1028 m-3. Resistivity is a constant of the material. Two wires having different lengths and thickness but made up of same material will have same resistivity. Resistivity of conductor is much small while that of insulator is large. Resistivity of a conductor increases with an increase in temperature. Resistivity of an insulator increases with a decrease in temperature. Resistivity and conductivity are inverse of each other. Resistance and conductance are inverse of each other. When external resistance R = internal resistance or 5  then power consumed by r is maximum. Therefore from the above observation we conclude that, option (a) is correct.
? (a)  give more mechanical strength.
? (c)  make it more stable.
? (d)  reduce the coil induction. You might like to Ohm’s law. To get answer to any question related to resistance and resistivity click here.